I wanted to share a discussion on the metals that I had with GATA’s Bill “Midas” Murphy this morning. I had emailed him to ask him if he knew of any reasons the metals were getting slammed today because the dollar was down a bit, the economic reports were poor and the stock market was selling off – all three occurrences of which are precious metals-friendly. 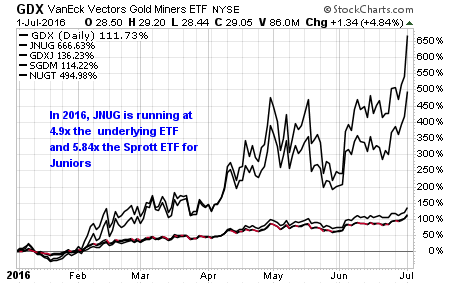 As Bill suggested, silver is under more pressure today than gold, with JPM going all out to get the speculative traders to sell, which helps JPM push the price down. If you look at short term chart, it would appear that silver is forming a head and shoulders “top” formation, something which JPM is trying achieve, as Bill correctly pointed out. However, technical formations almost NEVER work in the metals. Typically doing the opposite of the what the formation is indicating works the best over the last 15 years. That would imply a big upleg coming, which supports my view based on the fundamentals, which would support the view of another big move higher on the horizon. I think JPM is doing whatever it can to minimize the damage from the inevitable. The biggest seasonal physical buying period starts in another couple weeks. Next week is options expiry for Sept silver. They probably want to push silver below $19.50 if they can because the Sept silver put/call structure currently is favorable to the call-writers (i.e. JPM) is silver closes below $19.50 on the 25th. The problem is, the way the economy and the political system is melting down, they can’t control the possibility of a random news event hitting the tape that would send the metals soaring. I believe there’s high probability a news event like that could happen at any time. Silver is up 42.4 % since Dec 14, 2016. That is a HUGE run. If you look at a 1-yr graph, silver is trending sideways consolidating that gargantuan move it made in just 7 months. JPM and all of the other technical analysis cretins out there want us to believe that silver is forming a head n shoulders top formation. But it’s not. It was in danger of going parabolic, something we DON’T want to have happen. Yes, silver could go parabolic up to $50 and still be insanely undervalued relative to the supporting fundamentals, but the huge hedge fund trading algos would not treat it that way. Silver looks like it will pullback to its 50 dma, which is around $19.15 right now. As long as it holds that level – and they may crush it below that level with A LOT of paper for a few days, it will be ready for the next upleg. Since mid-Dec, we have been in an uptrend that is bouncing off of the 50 dma and moving higher. The RSI and MACD momentum indicators are signalling the probability that the current move is becoming “exhausted,” with probability weighted toward a move higher soon. At some point we might see a 200 dma correction. But silver could correct to its “chart” uptrend line around the $17 and still be up 24% since Dec 14. Anyone who would sneer at that ROR belongs in an asylum or is an internet blog terrorist. With all the action in silver and gold on Sunday night July 3, 2016 we, at Shadow of Truth, thought we would provide a quick update on what has happened and what could potentially happen. 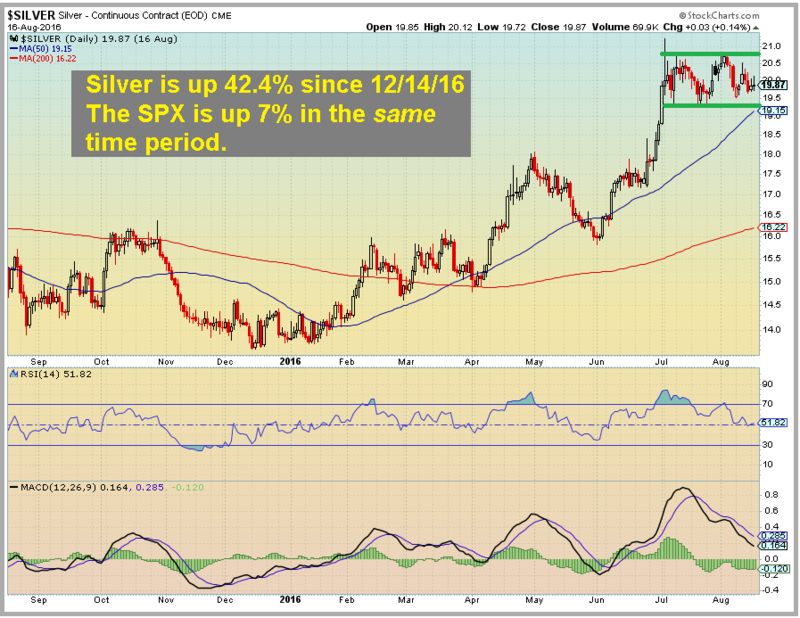 Silver, in particular, looks very, very bullish. Dave breaks down all the technical charts and Rory provides some color commentary. I know some of you have been projecting these nested ‘cup and handle’ formations on your own, because several readers have sent their examples to me and have asked for comments.My first comment is the most important and I wish you to take it to heart. Projections such as this are not forecasts, because the chart formations in these examples for the most part have not been ‘activated’ and are therefore merely potential things, possibilities, lines on a page subject to a great many exogenous forces and variables, including human and institutional decisions. Only the cup and handle ‘a’ on the chart below has been activated and achieved fairly quickly I might add. We are now working on ‘b’ and it will not be activated unless the price of silver takes out 21.50 or so. If you look at the following charts the picture it paints seems to be fairly clear. The first chart, weekly silver movement, clearly shows the first line being broken. The second line, approximately $27.00, is the next line of resistance. Once that line is broken, according to technical analysis, silver should run to the mid $30’s before it meets the next line of resistance. Will any of this happen? Your guess is as good as mine. What is 100% clear and undeniable – the first line of resistance has been broken and the algorithms should be entering the market. If silver stays above $20.30 overnight Monday July 4, 2016, the algo’s should kick in and it should be game on. The immediate “snap-back” in the stock market after a two-day post BREXIT vote 5.3% plunge in the S&P 500 has violated the sensibilities of all but the most idiotically apologetic stock market perma-bulls (Mark Zandi, Cramer, Suze Orman, Liz Sonders etc). It’s clear that the Central Banks are desperate to keep the stock markets from plunging, despite the fact that the deterioration of economic and financial fundamentals globally – including and especially in the U.S. – has begun to accelerate. 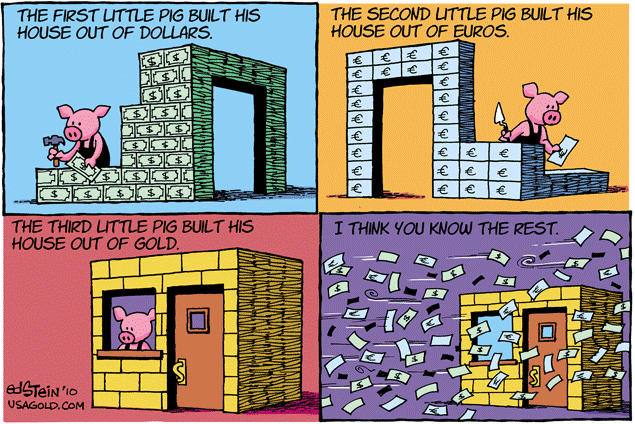 Smart investors smell Central Bank blood and the latest market intervention just reeks of desperation. This is the dynamic that is propelling gold and silver higher, despite the preponderance of bearish calls from all corners of the market, including many precious metals market analysts. The Central Banks went overboard with the latest round of stock market intervention. The recent increased movement of investment funds from fiat-based “assets” into gold/silver reflects the more widespread perception that the Central Banks are trapped by long series of bad policy decisions. The obvious conclusion is that Central Banks are now forced to hyperinflate the money supply or face a total stock market collapse. Of course, the hyperinflation of currencies will do nothing to stimulate real economic growth or fix the completely unmanageable global debt and derivatives problem. Perhaps the poster-child example of the damage done to the markets by radical Central Bank intervention and manipulation is Tesla (TSLA). If not Amazon, TSLA is perhaps the greatest stock Ponzi scheme in U.S. history. Aside being riddled with total accounting fraud, TSLA is technically insolvent and overloaded with debt that it will eventually impale itself on. It was reported today that the test driver in a TESLA self-driving car was killed when the car crashed into tractor-trailer at high speed. The test-driver was watching a movie in the car. At least he didn’t know what hit him. TSLA stock in a freely trading market would have been decimated today on that news. But today it’s trading unchanged from yesterday’s close. The only bigger tragedy than this fact is the death of someone who put their faith in Tesla. Tesla would not exist in its present form if it weren’t for the extreme Central Bank intervention and manipulation of the capital markets. It certainly would not have had the capital to work on an auto-piloted car given that its core business model lost nearly a billion dollars last year. This is the type of “blood” in the streets to which the price of gold/silver is responding. MSJ is a great resource!!! 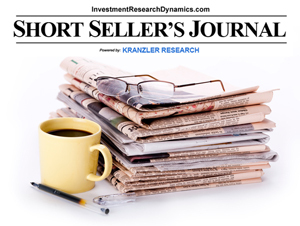 – Johnny – You can subscribe to my Mining Stock Journal here: LINK – or my Short Seller’s Journal here: LINK. I am currently offering new MSJ subscribers all of the back-issues (March 4th debut). I also offer a 50% discount on the second subscription to anyone who subscribes to both (email me for the discount link). I must say that Tesla is a perfect example of how screwed up the stockmarket is. Only bad news for the company like the purchase of the bankrupt company, Solar City. Wheels falling of the cars and bad suspension on cars that are almost new. Death accidents with malfunctioning auto pilots. Risks of lawsuits due to this. And the stock goes up- how retarded is this? No fundamentals matter at all. I´m really enjoying the silver rally and I bet you do as well. All the best from the negative interest rate Sweden. If the Comex were allowed to issue paper contracts representing no more that 10 or 20% of the actual amount of gold held by Comex vaults, what would the price of gold be? 1.176 million ounces of gold have been delivered – or should I say “delivered” – for the June contract six days into the June contract delivery period. I don’t follow the delivery patterns as closely as I used to, but this is a massive amount of stated deliveries. Even more interesting is the fact that there’s still 6,683 Juno contracts open representing 668,300 ozs of potential deliveries. This is a relatively high number of contracts still open this far into the delivery period. One other interesting point of note is that over the last few months, a couple new “players,” beyond the standard Comex bullion banks (JP Morgan, HSBC, Scotia) have been participating in the deliveries: B of A (Merrill), International FCStone Financial, Morgan Stanley and SocGen. All four of these have been taking an increasing amount of deliveries the past couple of months, primarily on behalf of customers (vs. for their own house account). I have no idea what would be triggering this sudden increase in delivery activity on the Comex – other than the obvious. And who knows to what extent the physical gold is actually being moved from the accounts of the delivering parties to segregated accounts of the parties taking delivery. It would be even more interesting if a lot of this gold was being removed from the Comex, which would reinforce the likelihood that it really exists in unencumbered physical form. 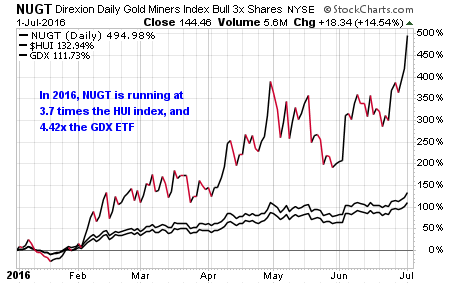 On another note, the stock portfolio portion of the fund I co-manage was up 4.7% today vs. the HUI up .23% and the GDXJ “junior” ETF up 1.7%. 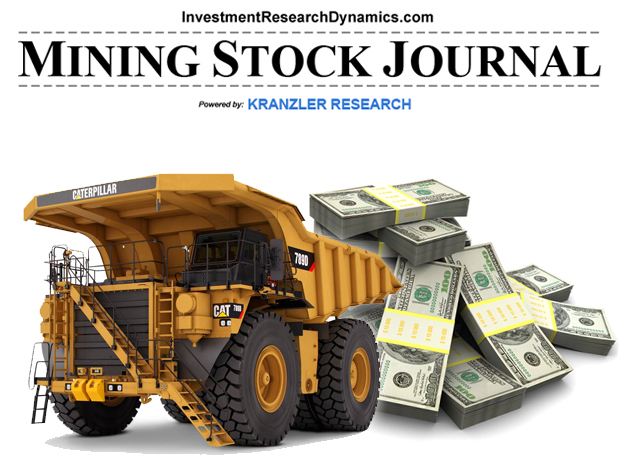 We own highly concentrated positions in true junior exploration stocks. My point here is that a lot of money is flowing into the highest risk/return segment of the mining stock sector. In my opinion this is a signal that the “smart” money is expecting a big move in the entire sector. 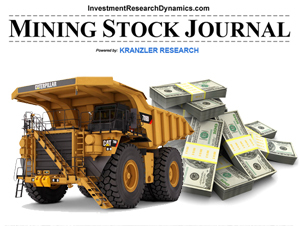 I publish the Mining Stock Journal, which is a bi-monthly subscription report which features a junior mining stock in every issue. I try to find lessor known ideas because I want to put my money in good ideas before the wider universe of newsletters begin to discover them. The next issue out this Thursday will be featuring a very small silver exploration company that appears to have found what could be very large silver (polymetallic) deposit. 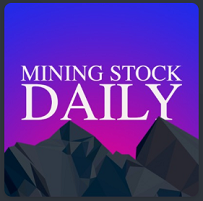 You can access the Mining Stock Journal here: MSJ Subscription Link. I am sending all-back issues to new subscribers. 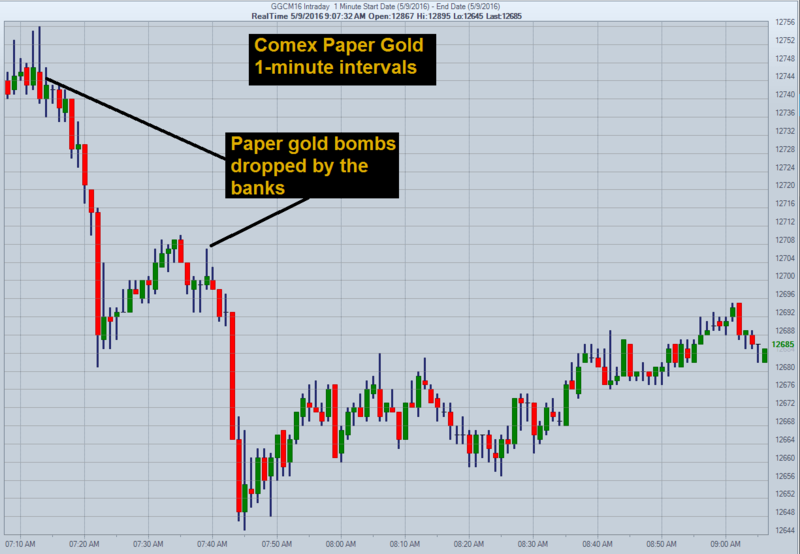 As discussed earlier, today’s price-action in the paper Comex gold market is nothing that a reflection of the Fed’s desperate attempt to keep the price of gold from breaking out above $1300. The reason for this is that a break-out above $1300 would trigger a lot of computer-generated buying and likely catapult gold in the $1500’s rather quickly. If you notice, since the end of April the Fed has slammed gold as it traded above $1290. $1300 was rejected on May 2nd and 3rd. It’s similar to when gold was punching on the ceilings set at $400, $500, $600 etc back in the mid-2000’s. Silver is a much smaller market and is used for more than just a currency and wealth preservation asset. Depending on the relative strength of the economy, up 70% of all silver is used for industrial applications. At the margin, a small incremental shift in the demand curve for investment silver has the potential to bury the issuers of uncovered paper silver (Comex futures, OTC derivatives, LBMA forwards, etc). When the Fed/ECB/BOE/BIS loses control of the precious metals derivatives markets – an event which could easily occur this year – silver’s rate of appreciation will stun most observers/commentators. The SGT Report invited me on its podcast show to discuss the precious metals market and the insidious corruption that has engulfed the U.S. system.